Don't you love it when an idea comes out as well as you had hoped? I wanted a savory and barely sweet ‘bread' that I could use for everyday snacking, as well as a gluten-free, low carb alternative to crackers on my cheese board. This Rosemary, Fig and Nut Bread is all that and more! In scouring the internet for a suitable recipe, I, of course, landed upon Elana's Pantry and her Cranberry Almond Bread. I was intrigued by the fact that her recipe contained ZERO grains…the base of the bread being almond butter. Since I happened to have an unopened jar of almond butter, I set to finessing the recipe to suit what I had in my mind. 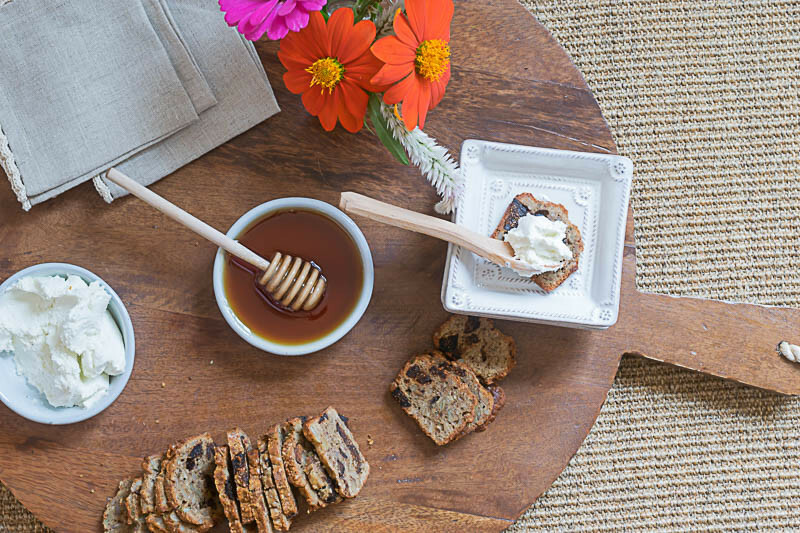 And then…top the whole thing with a drizzle of honey and you have the PERFECT appetizer, snack or breakfast treat. This Rosemary, Fig and Nut Bread whips up fairly quickly and can also be made in advance and frozen. I used my grandmother's 40+ year-old food slicer, similar to this one, to slice the semi-frozen loaves into even slices. I toasted some of the slices, which made them less chewy. My hubby preferred the Rosemary, Fig and Nut Bread toasted, while I preferred it not toasted. While the world may be divided along political lines, I think we can all come together and agree that the combination of goat cheese, honey and rosemary is probably one of the greatest combinations…EVER! In fact, if we all just consumed a regular dose of the combination, I'm pretty sure that harmony would envelop the planet. Agreed? I'll do my part…like right now! A mildly sweet bread full of nuts and seeds, with an added zip of rosemary. 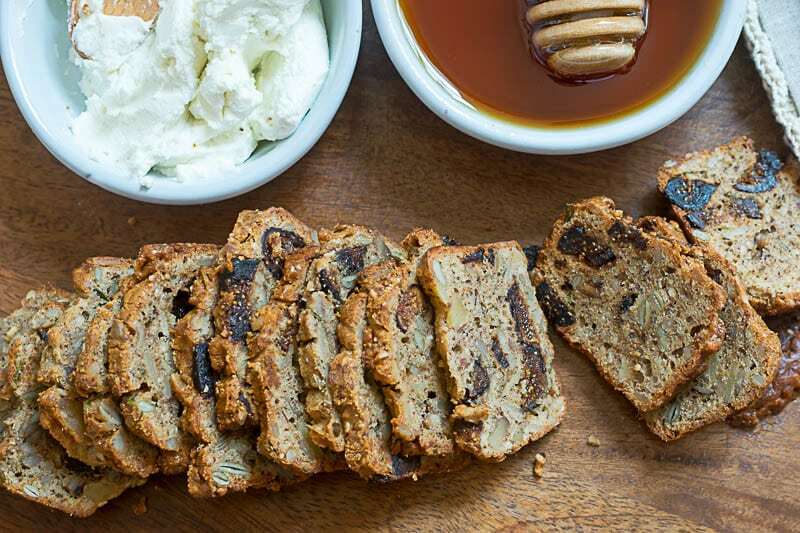 This delightful bread is sweetened only with the dried figs and contains no grains. Blend arrowroot powder/cornstarch mixture into almond butter mixture until thoroughly combined. Grease 3-3" by 5.75" loaf pans or 1 3.5" by 7.5" loaf pan and dust with almond flour. Bake at 350" for 20 for small loaves or 40 mins for larger loaves, or until an inserted knife comes out clean. And while I'm pushing the whole goat cheese + honey thing right now, let me just say that a shmear of Brie wouldn't be so bad either…or heck, just about any cheese would pair well with this bread. And thanks again to Elana for the inspiration and basis of this newly favorite recipe. If you want to give this gluten-free Rosemary, Fig and Nut Bread a whirl, then be sure to bookmark this page or pin the following image. Oh it is! Remember that bread at the bar in Columbus Circle? That got me thinking about this! They are a new favorite in our house.